You CAN have freedom from drugs and alcohol once and for all! When you learn that you are not a drunk or drug addict at the spiritual level, you unlock the door to sobriety. No lectures. No psychology. No hype. 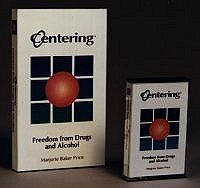 'FREEDOM FROM DRUGS AND ALCOHOL' is not about exercising your will power. With Marjorie Baker Price as your guide, you move through a powerful self-hypnosis exercise in which you meet your sober, liberated self. At last, you see that you really are FREE. This tape works! Marjorie Baker Price is an RN and author of the nationally acclaimed Centering Tools book and tape series for emotional, spiritual and physical balance and well-being. She can help you build a foundation for personal power. Cassette tape format. Any questions please contact me at Marjorie@centeringtools.com. 'I thank you for your genuine caring, your guidance and insight but most of all your ability to assist me in finding my own way towards empowerment, acceptance of myself and a true sense of healing. '-A.Z.